To follow up last week's big release, Zulrah, we are giving a visual upgrade to the snakelings and snakeling pets that came along with the update. If you are lucky enough to get your hands on a snakeling you will now get 3 different skins for your pet! You can switch between the different skins by right clicking your snakeling and selecting 'Metamorphosis'. As with any pet, snakelings are incredibly rare. Keep an eye out for them and make sure to get a good look when you see one, it won't be every day that one slithers by! 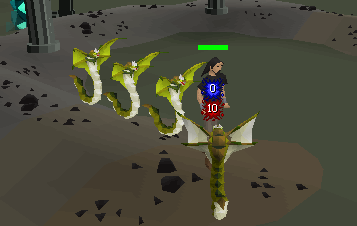 In addition to the snakeling pet getting a lovely visual upgrade, the snakelings that attack you during a fight with Zulrah have also received an update and will now look much more Zulrah-like. •	Zulrah now remains visible when he’s a long distance from his attacker. •	The cannon no longer works on the Mage Arena mages and Kolodion. •	The weeding, watering and composting patches on Miscellania and Etceteria should no longer get their states stuck. •	The different states of bullseye lanterns have had their names changed to avoid confusion in trading. •	Standard Iron Men can now use the Item Sets feature of the Trading Post. Ultimate Iron Men cannot. •	Some more shops have been split so that Iron Men access different stock to normal players. •	The Hitpoints skill guide now mentions venom. •	Advisor Ghrim’s name is no longer displayed incorrectly during the final conversation of Throne of Miscellania. In next week's update we will be bringing you some of the quality of life content from the poll that is currently running. If you are yet to vote, make sure you have your say while you can. Head to your nearest poll booth! Please note, if the Grand Exchange passes this poll it will be several weeks before it is released. P.S. While the servers are rebooting for the update, the sysadmin team is going to make some network changes. This means the game may be down for a few minutes longer than usual for this reboot. Apologies in advance for whatever delay this turns out to be. EDIT: Should be coming back online now. Apparently the sysadmins will have to come back and do more at a later date. Vote yes for the GE! I have to get myself a snake pet soon..